Moon Phases and Large Earthquakes. | Chaos Sweeps Away the World We Know! The Disaster, current events & Catastrophe Blog. Forecasts for 2014 to 2022. Read tomorrows news today! Plus current economic, commodities, stock indices and financial news. March 14, 2013 – Moon Phases versus Large Earthquakes: Several analysts have come to the conclusion that most large earthquakes occur during the New or Full Moon Phase. This is because the Moon generates the tides in the oceans, however, it also produces “Earth Tides” or slight bulges in the Earth’s crust, which might trigger quakes in fault lines that are ready to give way. To check this hypothesis I prepared the astrological horoscopes of 133 large earthquakes (EQs), and separated them into Moon Phases. The chart above displays the results. The Moon phases are divided into the eight traditional periods as follows: (1) Zero degrees (*) or the new Moon, (2) 45* or the Crescent Moon, (3) 90* – 1st Quarter, (4) 135* – Gibbons, (5) 180* – Full, (6) 225* – Disseminating, (7) 270* – 3rd Quarter and (8) 315* – Balsamic. This divides the 360 degree circle into 45 degree slices, called sesquisquares. 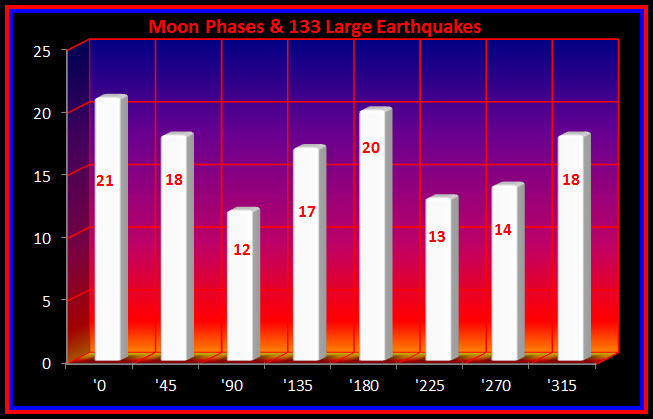 As you can see, the New Moon had the highest number of large quakes with 21, followed by the Full Moon with 20. The first and third quarter phases of the Moon generates the least “Earth Tide” affects and we would expect the least number of quakes. As you can see, the 90 degree 1st quarter had the least number of quakes with 12. The third quarter phase, also, had a low number of quakes with 14. Therefore, their might be some truth to the hypothesis that large quakes occur during New and Full Moon phases, however, the connection is weak. For example, the 9.1M Japanese EQ, on March 11, 2011; occurred on the Crescent Moon (69* Sun/Moon angle). The 8.8M Chile EQ, on February 27, 2011; occurred on a gibbons phase (159* Sun/Moon angle) and the 9.1M Indonesia EQ, on December 26, 2004; occurred on a gibbons phase (173* Sun/Moon angle). This entry was posted in Chile, Earthquake, Events, Indonesia, Japan, Misc, Miscellaneous, Nature, Ring of Fire and tagged 1st quarter moon, 3rd quarter moon, astronomy, balsamic moon, Chile, chile earthquake february 27 2010, crescent moon, disseminating moon, earth, earthquakes, earthquakes by moon phases, full moon, gibbons moon, indonesia earthquake december 26 2004, japan earthquake march 11 2011, lunar phase, Moon, moon phases and earthquakes, moon phases and large earthquakes, moon phases and tremors, new moon, Planet, sesquisquare, Solar System, The Master of Disaster, third quarter moon. Bookmark the permalink.